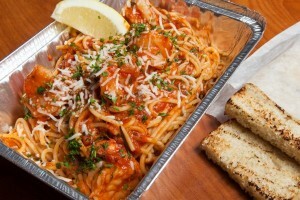 Authentic Italian food brought to you by an Italian-trained chef. Popular coffee-flavoured Italian dessert made with ladyfingers dipped in coffee and mascarpone cheese. Italian sausage and chicken with fresh herbs and rosé sauce. Lean beef, a variety of cheeses, and rich rosé sauce. Garlic bread baked with parmesan and mozzarella. Breaded chicken cutlet baked with mozzarella and a touch of tomato sauce. Homemade bread served with olive oil and balsamic vinegar. Grilled focaccia bread, fresh tomato, basil, extra virgin olive oil and Parmesan cheese. Italian cold cut meats, cheese and pickled vegetables. Black tiger prawns sauteed in a garlic butter, fresh herbs and white wine sauce. Lightly breaded and served with spicy Sicilian tomato sauce. Fresh clams sauteed in white wine or tomoato sauce. 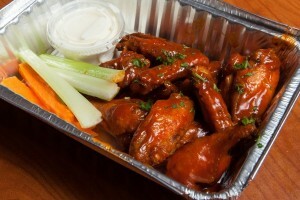 A full pound of succulent chicken wings tossed in your choice of Frank’s Red Hot, Teriyaki, or BBQ. Our homemade meatballs baked in garlic tomato sauce, with mozzarella and Parmesan. Baked with garlic lemon butter. 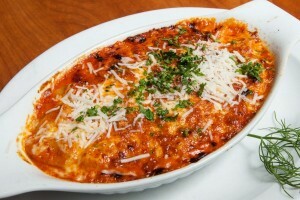 Baked eggplant, tomato basil sauce with mozzarella and Parmesan cheese. With garlic, shallots, onions, fresh herbs, and red wine demi glaze. Light chicken broth with egg, parsley, and Parmesan cheese. One of a kind homemade seafood chowder. Homemade Italian country style vegetables. Fresh, crisp mixed greens and veggies with house dressing. Oven roasted croutons, topped with parmesan cheese. Balsamic vinegar, olive oil, fresh basil, tomatoes, capers and bocconcini. Ham, cheese, artichokes, black olive, tomato, julienned veggies, tossed with crispy romaine & homemade dressing. Fresh lean beef, fresh basil, and tomato sauce. Black tiger prawns in a roasted garlic, white wine, spicy tomato sauce. Anchovies, capers, black olives, garlic and chililes in a tomato basil sauce. Sautéed tender young squid with garlic, basil, white wine and tomato sauce. 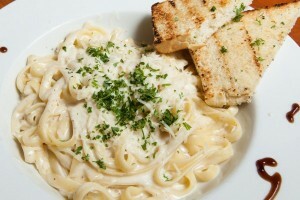 Parmesan cheese and nutmeg cream sauce. Chicken, mushrooms, and spinach with fresh herbs and garlic cream sauce. 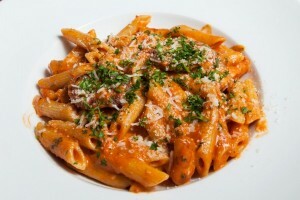 Fresh and smoked salmon cooked with creamy tomato sauce. 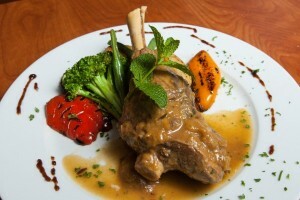 Vegetables in a seasoning, sautéed in olive oil with tomato or cream sauce. 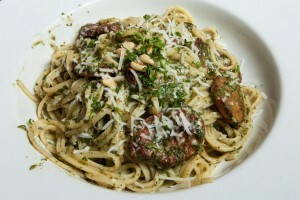 Fresh basil, toasted pine nuts, garlic and parmesan cheese. Pancetta, Scallions, free range egg, parmesan and reggiano parmesiano. Fresh clams with fresh basil, lemons and garlic white wine tomato sauce. Prawns, calamari, clams, mussels, salmon, and white fish in a fresh herb, white wine, tomato sauce. Traditional home-made potato and egg dumpling available with tomato, cream or meat sauce. With white wine, shallots, onion, roasted garlic, in a rosé sauce. Extra virgin olive oil, garlic, chilli flakes, and parsley. Pancetta, garlic, and Italian herbs in a red wine tomato sauce. 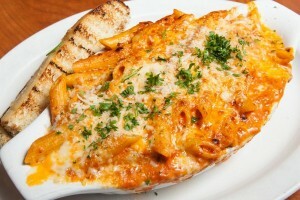 Served with your choice of grilled vegetables and potatoes; penne pasta in a cream sauce; or penne pasta in a tomato sauce. Grilled 9oz NY Strip topped with sautéed mushrooms, fresh rosemary red wine and demi glaze sauce. 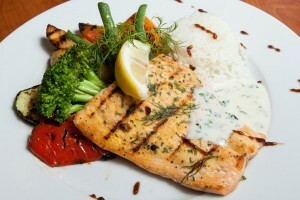 Wild fillet of salmon grilled to perfection. Lean chicken breast in a red wine with capers, calamata olives and a touch of tomato sauce. Fall off the bone tender, slow roasted. Baby back ribs smothered in honey citrus BBQ sauce. Grilled chicken breast with mushrooms cooked in a white wine Demi glaze cream. 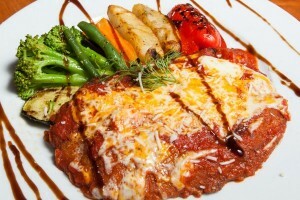 Breaded veal cutlet baked with mozzarella and tomato sauce. Chicken breast cooked in a marsala wine and wild mushroom sauce. Lean beef, a variety of cheeses, and rich tomato sauce. Beef stuffed tortellini cooked in a rosé sauce and baked with four cheeses. Homemade potato dumplings in a creamy gorgonzola sauce. Traditional apple pie slice garnished with cinnamon and icing sugar.